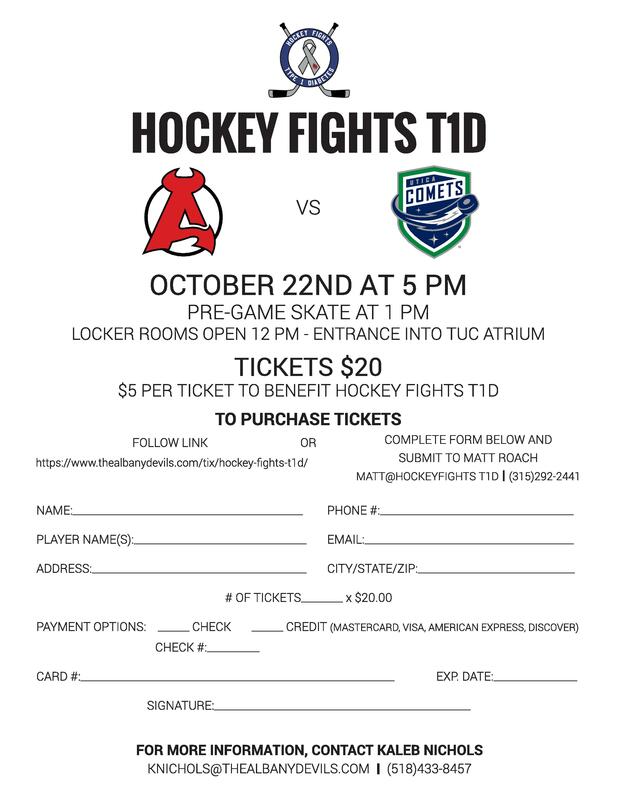 Who is ready to take the Hockey Fights T1D party on the road to the Times Union Center home of the AHL’s Albany Devils? We have booked ice on Saturday October 22nd at 1pm! Cost will be $20 and includes ice time, ticket to the Comets vs Devils games at 5pm that night, and $5 being donated to the JDRF. IF YOU ARE PLAYING IN THE GAME PLEASE SEND ME AN EMAIL (MATT@HOCKEYFIGHTST1D.ORG) ONCE YOU HAVE ORDERED TICKETS SO I CAN ADD YOU TO THE PLAYERS LIST! I do have to sell a minimum number of tickets to please order and sign up ASAP. Doors will open at 12pm and the game will be at 1pm. We will have about an hour and a half of ice time. After the game we will leave to go get food in the area before returning for the game at 5pm. We will be using the blue and white jerseys that we used in Syracuse for this event. If you have a premium jersey please feel free to wear it. Weekend parking is free on the streets, there are several lots around us that charge various amounts. The Times Union lot charges $8 per car. All the lots are a pay for entry, so once you leave you will have to pay again to re-enter.